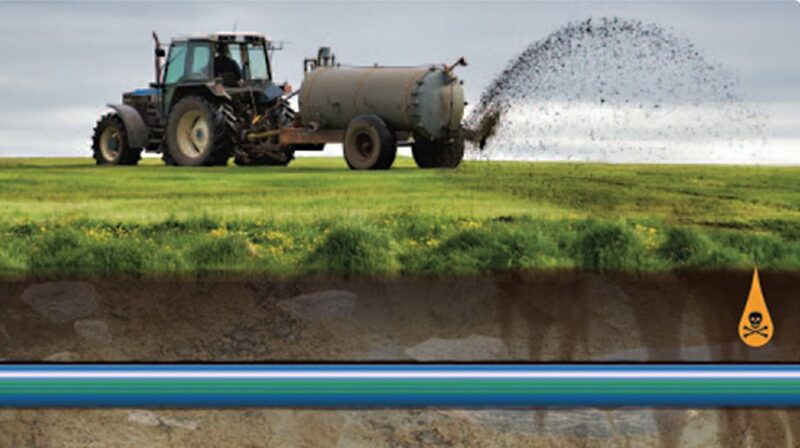 In situations where the quality of our drinking water is at stake as well as in view of the challenges faced by planners and utility companies forced to tackle increasingly over-fertilized and chemically polluted soils, certified plastic pipe systems with a barrier layer to prevent contamination from pollutants help to ensure a sustainable drinking water supply and thus a high quality of life. Moreover, combining these pipes with state-of-the art trenchless installation methods allows for additional cost benefits and enables customers to realize a future-proof pipe network. Water is a product of nature and the central prerequisite of life. On a worldwide scale, ground water resources (which in Germany currently provide an average supply of 120 litres per person and day) represent the major source of water. For contemporary water management, ensuring the application of all technical solutions available in order to rule out hazards around any undesirable contamination of our drinking water enjoys top priority. Accordingly, its goal is to guarantee a consistently high quality of our drinking water, from its production to its distribution via the pipeline network. But what implications does it have if environmental influences impair the quality of drinking water, increasing the responsibility borne by utility companies more and more? One example referred to in recent studies undertaken by the Federal Environment Agency is that our groundwater is too heavily polluted by nitrate. It is the nitrogenous fertilisers—mineral fertilisers and liquid manure spread on the fields according to common agricultural practice—which are deemed to be to blame for this situation. As a result, both the financial investments that water companies need to make in order to ensure that the drinking water derived from our groundwater continues to be free from harmful substances and safe for human consumption have grown significantly, and the technological processes required to achieve this goal have become increasingly sophisticated. Prevention of contamination is an important element in the process chain as a whole—from the production and treatment of our drinking water to its distribution via the pipeline network – and will become even more vital in the future. Preventing contamination which might involve health hazards to the greatest degree possible helps to spare our resources from contamination while at the same time reducing the effort and cost associated with the technologically demanding, time-consuming and costly processes involved in treatment of potable water. In order to preserve the purity of drinking water on its way to consumers and to guarantee an ongoing provision of safe drinking water, egeplast has developed pipe systems which provide maximum protection over a 100-year life cycle while at the same time enabling cost-efficient installation using trenchless installation methods. Standard pipes do not offer this kind of protection. Whenever planners and utility companies face the challenge of installing drinking water pipes in areas with contaminated soil or where the soil is exposed to contamination hazards, the medium transported via the pipeline might get contaminated owing to ingress of hazardous substances through the pipe walls, whether they are dealing with contaminants resulting from over-fertilisation in an agricultural environment or with soil contaminated by hydrocarbons in industrial areas. Using an intelligent combination of the material properties of thermoplastics and the barrier effect provided by metal, the SLA® Barrier Pipe pipe system developed by egeplast rules out any permeation of pollutants into the drinking water, thus reliably protecting it and exploiting the cost benefits associated with state-of-the-art installation methods for plastic pipe systems. Even any unacceptable permeation via the corresponding fittings which complement the system has been ruled out. During installation, the system is subjected to joining techniques as provided under the DVS set of rules. Accordingly, it is not equipped with any sealing rings at the connection points which are open to diffusion. The SLA® Barrier Pipe system has been certified by the Dutch KIWA Institute for installation in contaminated and potentially contaminated soil since as early as 1995. This way, it complies with the highest requirements stipulated by the BRL 17101 standard applicable in the Netherlands which governs the requirements for drinking water pipes meant to be installed in contaminated soil. Moreover, it serves as the certification benchmark for barrier pipes equipped with a barrier layer made of aluminium. The recently revised standard has now come to also define the requirements for pipes to be used for extremely high levels of contamination, the so-called “class III”. Class III provides a detailed description of forms of contamination which even include saturated solutions of toxic aromatic hydrocarbons present in the surrounding soil. The SLA® Barrier Pipe also fully meets the requirements for class III, thus providing full protection from any kind of contamination.